Although it is often overshadowed by glorified American pickup trucks, the 2018 Toyota Tundra is quickly becoming a bright spot in the race for hard-working home-built trucks. Click here to find out more. Although it is often overshadowed by glorified American pickup trucks, the 2018 Toyota Tundra is quickly becoming a bright spot in the race for hard-working home-built trucks. Unlike many pieces of automotive luxury, every Toyota Tundra has and continues to be assembled with globally sourced parts in San Antonio, Texas. In fact, the updated 1794 Tundra edition takes its name from the year the ranch on which the Toyota plant now sits was founded. Along with being built in the USA, Toyota has also been building hard-working Tundra’s for over 80 years. This is why Toyota continues to deliver on the promise of toughness with over 90 percent of all Tundra’s sold over the last ten years continuing to burn up all kinds of roads today. Thanks to two available V8 engines, the newest part of the Tundra lineup is able to produce over 300 HP and up to 400 lb.-ft. of torque. Both engines are paired with an either six-speed automatic, rear- or four-wheel drive transmission. To handle the torque of Tundra’s available 5.7-liter V8, Toyota’s highly trained engineers also fitted the rear differential with a massive 10.5-inch ring gear, which allows the use of an aggressive 4.30 rear axle to handle anything that you can throw at it. 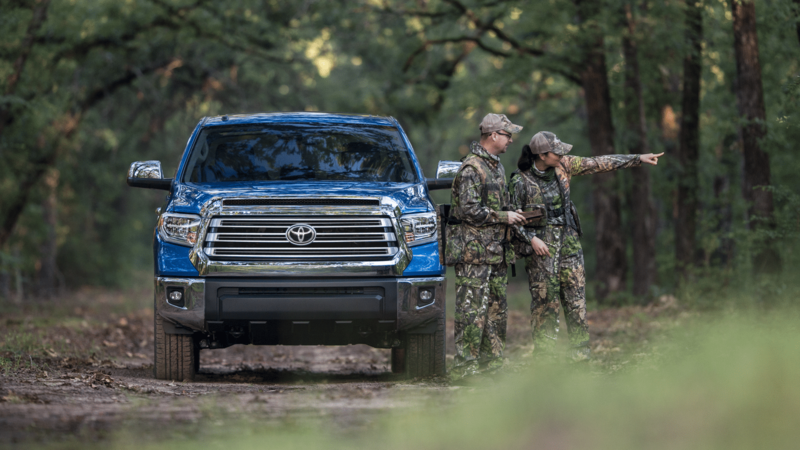 Offering the optimal blend of functionality and comfort, the all-new Tundra’s spacious cabin offers you and your entire crew plenty of room to stretch out. Offering more than just muscle, this Tundra represents everything that you could possibly want in a premium truck. Along with sliding behind the wheel onto soft-touch seats, this luxurious Tundra also offers comforting amenities like dual zone automatic climate control with individual temperature settings for both the driver and front passenger. Thanks to a large center console with a covered storage compartment, which includes a 12V auxiliary power outlet, as well as rear seats that fold-up to offer added cargo storage the Tundra also offers the functionality of an office on wheels. With features like staggered, outboard-mounted shocks, a heavy-duty Triple-Tech frame with integrated towing hitch receiver – plus a trailer hitch that utilizes 12 high-strength bolts integrated into the frame – Toyota’s most powerful pickup has the available burliness to help you tow over 10,000 lbs. The TOW/HAUL Mode also intelligently holds lower gears longer, to keep your 2018 Tundra from shifting or hunting for the right gear when towing. This system even increases throttle response, pulling power and engine braking, helping you tow all those boy toys with ease. Like most new Toyota models, the Tundra comes standard with the Star Safety System, a suite of six advanced safety features that include Vehicle Stability Control, Traction Control, Anti-Lock Brake System, Electronic Brake-Force Distribution, Brake Assist, and Smart Stop Technology. Combine all of this with a fully functional blind spot monitoring system and backup camera and you have one of the safest full-size trucks available.